August events at Aberglasney House and Gardens - 10th – 16th August Celf Canolbarth Cymru – Mid Wales Arts will be presenting an exhibition titled ‘Marking the Seasons’. There will be a wide range of beautiful art work, showing the artists’ unique response to the natural elements of the wonder and beauty of the ever changing seasons. 17th – 30th August Jayne Russell will be returning to Aberglasney to exhibit her wonderfully diverse range of paintings, from castles to landscapes and seascapes, not forgetting a large display of paintings of Aberglasney Gardens! Grounds open for picnics from 6:30pm. Please bring your own rugs or low-backed seating. To book tickets please ring the ticket office on (01558) 667958. Rest day for me in the Olympics! Catch-up day today - rest and wash Olympics uniform before final four-day shift. 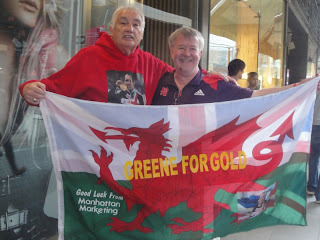 At the entrance to the Olympic Park, I found @DaiGreene fan Mike Walters (his old Coedcae PE teacher). Back on Olympics duty in London this weekend. Covering the traithlon in Hyde Park and the men's 20K walk in The Mall yesterday. Today, it's the woman's marathon, starting and finishing on The Mall.